These kings do not wear crowns but they do attract a crowd! 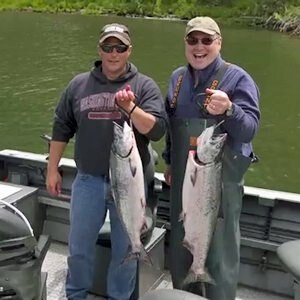 Anglers are heading to the Gorge, where the summertime king salmon are on the bite. 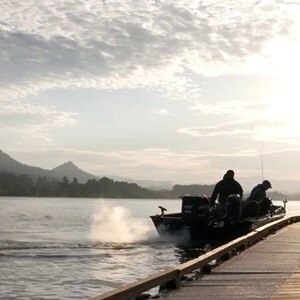 As we leave the popular boat ramp and dock, “The Fishery” near Bonneville Dam, fishermen Jim Milanowski and Chong Chang agree that summer fishing in the Columbia River Gorge offers the best of both worlds: long, warm days and plenty of big fish. 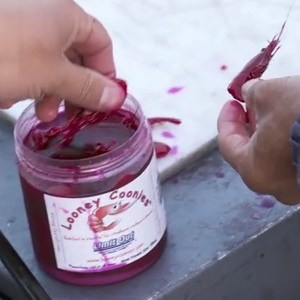 His bait of choice is the one he created, called Looney Cooney Shrimp. Looney Cooney? You heard right. 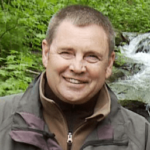 Over the past 20 years Milanowski has created, refined and perfected his bait recipe. While he won’t reveal specifics, we do know the Looney Coonies are soaked in a sauce of colorful dyes and scents. Each batch takes up to three weeks to cure before they are ready for delivery to a loyal and growing list of retail outfits and professional fishing guides. A century ago, June hogs could tip the scales at more than 100 pounds. The giant chinook were prized for their size and taste. But the native run of June hogs all but disappeared after Grand Coulee Dam was completed in 1942. Today, the summer salmon fishing begins in mid-June and runs through July. You can fish for hatchery summer salmon throughout the Columbia River system in a boat or on the bank at scores of places below Bonneville Dam. If you’re interested in taking time out from the hustle and bustle of daily life, find a stretch of sand at places like Dibblee Beach on the Columbia River near Rainier. The Oregon State Marine Board offers a free Columbia and Willamette River boating facilities guide available for download online. It’s a valuable resource that will be a good starting point for the newcomer. One way to learn is to check out the ODFW’s summer steelhead website — it offers a ton of useful information. If you’re lucky, the Looney Cooney Shrimp may come through for you the way they worked for me as my 10-foot rod doubled down from the strike of a hard-charging chinook. The husky salmon makes several strong charges away from the boat, but within 10 minutes, I slid the chrome-bright king into Jim’s large mouthed net. It was a terrific 15-pound salmon and Jim notes there’s still plenty of time for you to get out and give the summer chinook experience a cast. Oh yes — this fishery just gets better as the July calendar moves along, so folks should really give it a try. The weather is warm and the days are so long; it’s an all-around great time to be outdoors.